Pedro Infante, one of Mexico’s most famous golden-age actors, appeared in 60 films and recorded over 350 songs. Known as Mexico’s Frank Sinatra, the actor was born in Mazatlan and his life is celebrated by the seaside Sinaloan city. There is the famous Pedro y Lola’s restaurant in Plaza Machado, and also a monument to him on the south end of the malecón, not too far from where visitors can find Mazatlan’s cliff divers. In his monument, Pedro Infante can be found riding a motorcycle in honor of his role in the movie A Toda Maquina. Ride off into the Sunset... Classic Cinema. 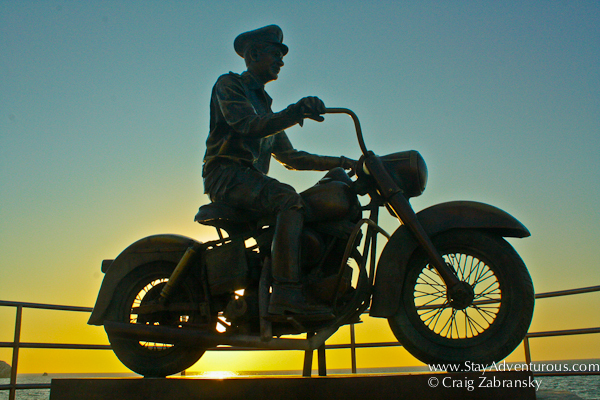 Visitors often enjoy sunsets on Mazatlan’s malecón and the Sunset Sunday Series posted many from Mazatlan, but this week you can ride off into sunset with one of Mexico’s icons – Pedro Infante. Happy Sunset Sunday! For more information on Mazatlan, you can also listen to my interview with Amateur Traveler; push play below to hear the full 35 minute episode that covers everything on Mazatlan. Gracias Maria, for a more detailed look into to Mazatlan, definitely listen in to the podcast… warning: it will make you want to go to Mazatlan.